Time Equities Inc. Art-in-Buildings is pleased to announce the newest exhibition at the West 10th Window: Zach Wollard, Zero-Sum Game. 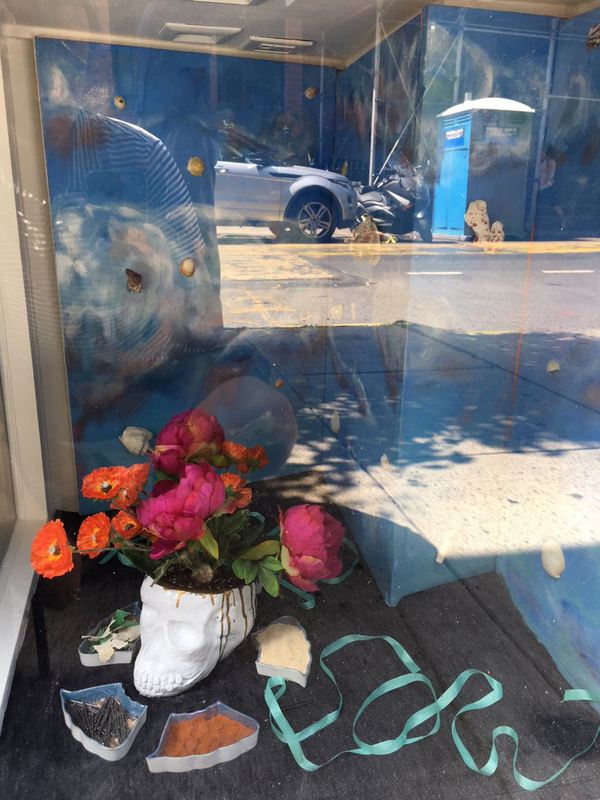 In Zero-Sum Game, Zach Wollard painted the walls of the West 10th Window with a dreamy cloudscape dotted with seashells and created a shrine of delicate objects, the centerpiece a white skull sprouting vibrant, colorful flowers. Wollard considered this installation within the context of the West 10th Window's immediate neighborhood – one of extreme wealth, materialism, and conspicuous consumption. Wollard's practice examines our culture's constant drive for more – for progress, success, and growth at any cost, without regard to our environment or to vulnerable communities. Zero-Sum Game comments on this state of mindless privilege and its environmental impact. The white skull, bleeding gold, grows flowers from its head, contrasting clear references to death, decay, and wealth with life, growth, and awakening. 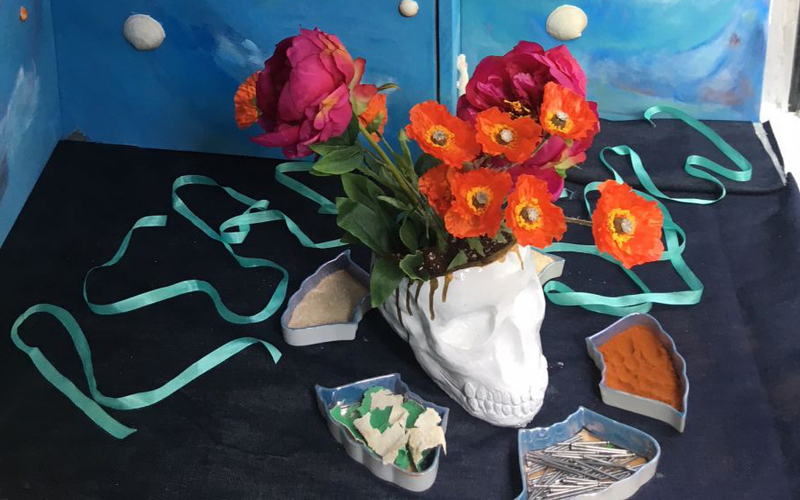 Surrounding the skull are five ceramic dishes filled with paint chips, sawdust, nails, paprika, and sand, each representing various aspects of integration and disintegration. 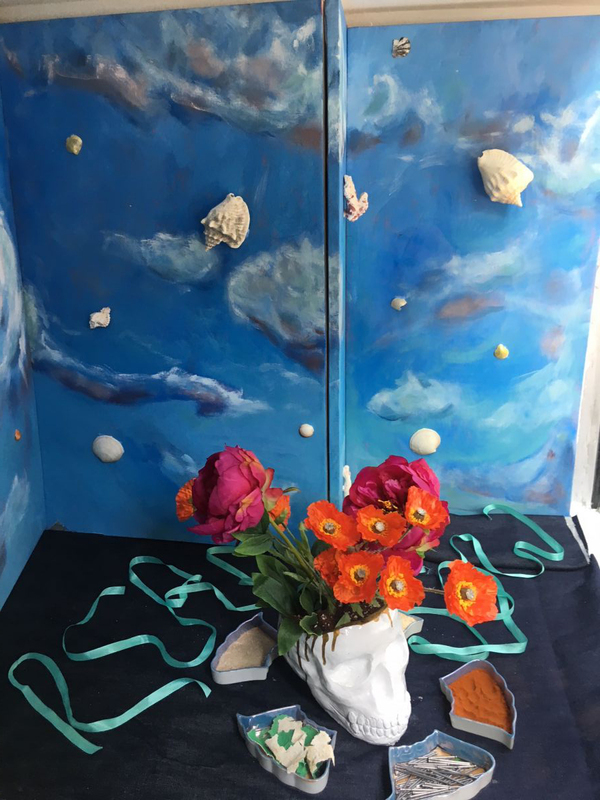 A vibrant turquoise thread draped to read "reap" and "sow" on either side of the skull presents a final poetic visualization of our interconnectedness. Zachary Wollard was raised in Kansas City and attended Columbia University and the Skowhegan School of Painting and Sculpture. He was a recipient of a Sharpe-Walentas grant in 2016. His work has been included in numerous exhibitions internationally and is in the collections of the Museum of Modern Art, NY and The Whitney Museum, amongst others. Next up at the West 10th Window: Nooshin Rostami, Robbin Deyo, and Ryan Frank.